"Dear Sir, Is this a record?" You'll have to log-in or register, but you won’t be asked to buy a subscription or provide credit card details (unless you inadvertently try to access records which aren't include in the offer). Please use this link - it will take you to a page where all the free record sets are listed. Searching for cousins is always free, but to initiate contact with a new cousin normally requires a LostCousins subscription - however from Friday 23rd February until Monday 26th February you can contact the living relatives you find without paying a penny. Tip: it doesn’t matter whether your cousin responds before the offer ends, so long as you initiate contact before midnight on Monday. How do you make the most of this opportunity? By adding to your My Ancestors page all the relatives you can find on the 1881 Census. Why 1881? Because this is the census your cousins are most likely to have used. Remember, ALL of your cousins are descended from the branches of your tree - that's what makes them cousins - so research as many branches as you can, following them through the censuses until you get to 1881. Tip: the 1881 censuses are always free, but having access to other censuses is a big help - that's why I've timed this offer to coincide with Ancestry's free weekend. You can save up to £28 when you take out a NEW Pro or World subscription to Findmypast and claim a free LostCousins subscription - see this article in the last newsletter for more details of this offer, which has been extended until the end of February. You MUST use the link in the article. Note: the offers do not apply to existing Findmypast subscribers, only to new and lapsed subscribers. The Genealogist has added full colour tithe maps for Buckinghamshire; tithe maps for most other English counties are also available (though not London), but the only other counties with colour maps at this point are Middlesex, Surrey, Northumberland, and Westmorland (plus the city of York). The Irish Genealogical Research Society has posted several video tutorials to help researchers with Irish ancestry - you'll find them here (and they're free). UPDATE: only members are now able to view the videos. Britain has been invaded many times, but the evidence is that the invaders merged with the existing population rather than displacing it - except when the so-called 'Beaker' people arrived 4500 years ago. According to research published in Nature and summarised in this BBC article, 90% of the gene pool was replaced within a few hundred years, suggesting that the indigenous population had virtually died out. This could have been the result of the invaders being better adapted to a changing climate (the population of Britain was already falling between 3500BC and 2500BC) or, perhaps, because they brought with them diseases to which the British population had no natural resistance. I'd like to think that before spending out on a DNA test you re-read what I'd written about DNA over the past year. If you didn't, now is the chance to put that right - and I'm repeating below my Masterclass which sets out how to deal with the 10,000 or more matches that you'll get when you test with Ancestry. Note: if you haven't tested your DNA yet see this article for the latest offers (the Ancestry DNA offers in North America end on Sunday). No matter how much experience you might have as a family historian, it would be understandable if, when the results of your DNA test came through, you were completely flummoxed about what to do next. There's a simple reason for this - we're used to working backwards from what we already know, so there's a clearly defined path, ie: find our ancestor's baptism in order to discover (or confirm) who their parents were, then find the parents' marriage, then find the baptisms of the parents and so on, working back a generation at a time. Of course, in practice only a small fraction of your cousins will have tested - even Ancestry, the biggest providers of autosomal tests, have only sold about 10 million tests - but you can nevertheless reckon that the cousins you're matched with will be distributed roughly in proportion to the figures shown above. In other words, over 99% of your matches will be with relatives who are at best 5th cousins, and could well be 8th cousins or even more distant. 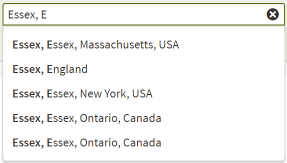 Tip: Ancestry won't show any of your DNA matches as more distant than '5th to 8th cousin', but it's very likely that amongst them there are many who are more distant - possibly as many as half of them. Once you get beyond 3rd cousins the length of the shared segment(s) is only a very rough guide to how closely you are related - you could share a 7cM segment with a 10th cousin, but no detectable DNA with a 5th cousin. You and your 5th cousin shares the same great-great-great-great grandparents. Now, I don't know about you, but I certainly can't say who all of my 4G grandparents were - indeed, I don't even know for sure who all my 3G grandparents were. I've got several 'brick walls' in the last 5 generations - and most researchers, including my DNA cousins, are probably in the same situation. Go back another generation and there are even more gaps - and it just gets worse from then on. In other words, most of the ancestors that link us to our DNA cousins are on the other side of a 'brick wall' - and this could be a 'brick wall' in your own tree, in your cousin's tree, or even in both trees. What a challenge! At this stage it's important to remind ourselves why we took a DNA test! Surely the primary reason we tested was to knock down 'brick walls' that conventional research couldn't breach? If our 'brick walls' have resisted our efforts for years (or even decades), the opportunity to knock them down using DNA is surely well worth grasping - even though it will mean that we have to adopt a new and unfamiliar strategy, and utilise somewhat different techniques? Make sure that you've done all the conventional, records-based, research you possibly can. Complete your My Ancestors page, ensuring that you have entered ALL of the cousins (no matter how distant) that you can find on the 1881 Census. Yes, it might take you an hour or two, but skipping this important step could cost your tens or even hundreds of hours when you come to analyse your DNA matches. Tip: start in 1841 and trace each of your branches (sometimes referred to as collateral lines) through to 1881. Remember, DNA testing isn't a substitute for records-based research - you need to do both to have a reasonable chance of success. Each builds on the other - if you only do one you're almost certainly going to fail. I'm going to assume for the purpose of this article that you tested with Ancestry - but don't stop reading if you tested elsewhere because I'll be covering techniques you can use, though not as effectively, at Family Tree DNA and GEDmatch. 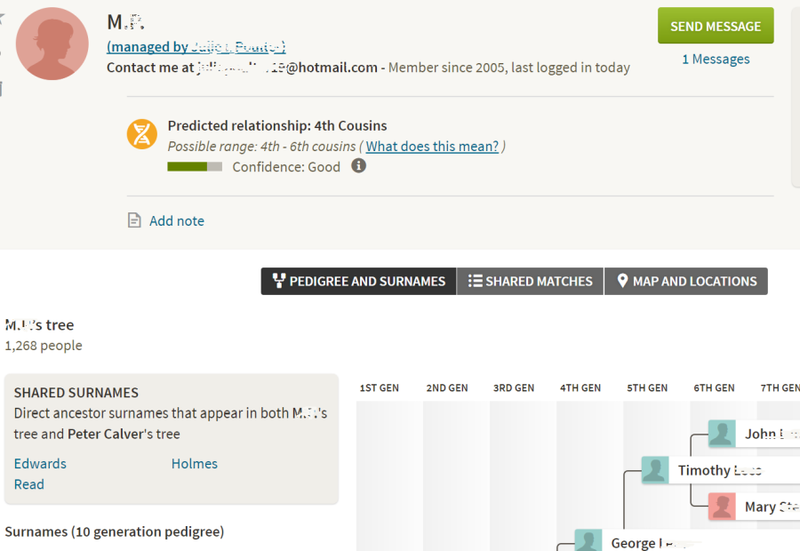 At Ancestry you'll typically have 10000 to 20000 matches with cousins, and of those all but about 1% will be with 'distant' cousins, ie where the estimated relationship is 5th cousin or more distant. So you might think that the best strategy might be to focus on the 1% on the basis that if you can't make head or tail of those matches, your chance of resolving the more distant matches is negligible. Wrong, totally wrong!!! Tip: unless the surname is a very rare one I don't enter a birth location - and even when I do enter a birthplace, I usually only enter the country; note that any birthplace you enter must be selected from the suggestions that Ancestry propose. Enter the surname of one of your 'brick wall' ancestors and click SEARCH. This filters out the matches who haven't provided any family tree as well as those who have got a tree, but where nobody in the tree has the relevant surname. You can’t use wildcards and I wouldn’t suggest checking the 'include similar surnames box' either, as in my experience the results are erratic. Instead carry out a separate search for the main variants. If the other person has a public tree then, even if your own tree is private, Ancestry will automatically identify the surnames of direct ancestors which appear in both trees. But they won't tell you about other surnames which occur in both trees, even though these matches can be equally important, so it's well worth glancing through the complete list of your cousin's ancestral surnames. Most of the time there won't be an obvious connection between you and the other member, but that doesn't mean that you should give up - there are still two more things you can try. If you're able to identify a potential link send a message to your cousin telling them what you have managed to figure out - they may have additional information that isn't on their tree. You'll also need to contact your cousin if their tree is private. But if you're unable to figure out how you and this particular cousin might be related, first make a note of this fact (click the Add note link), then move on to the next person in the list. When there are no more matches with cousins who share this particular ancestral surname move on to the next surname, remembering that whilst we tend to focus our attentions on a small number of particularly frustrating 'brick walls', every ancestral line in our tree terminates with a 'brick wall'. When you have worked through ALL of your 'brick wall' surnames it's time to move on to the next strategy…..
As you will have discovered when working through your list of surnames, most of the time the surname of the ancestors you share with a DNA cousin doesn't appear in both trees - indeed, it's quite possible that the surname of your common ancestor doesn't appear in either tree! Of course, this problem doesn't simply affect you and your research - it affects your cousins too; most researchers' trees become increasingly sparse with each generation. If you've only identified 10% of your 256 6G grandparents and your cousins have only identified 10% of theirs, the odds of finding out how you're related to a 7th cousin simply by comparing the names in your trees are pretty remote. 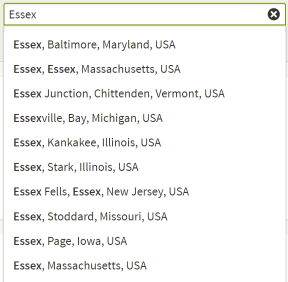 It's important to include the comma - simply typing 'Essex England' doesn't work. When you find a DNA cousin who has ancestors from the same area the next step is to evaluate how likely it is that finding the connection could knock down one of your 'brick walls. For example, if your cousin's most recent ancestors from that location were born in the 1600s, but your most distant ancestors from the same location weren't born until the 1800s, the chances of being able to knock down your 'brick wall' are minimal, since there are many generations separating you. On the other hand, if you both have 'brick walls' around the same time, there's a chance that going back just one generation would knock down both 'brick walls'. Most readers of this newsletter have mostly British, Irish, or western European ancestry. But some of you will have Jewish ancestors, or ancestors from outside Europe, and whilst ethnicity estimates can be quite misleading, they do provide another way of analysing your matches. If Ancestry had detected a Jewish component of my own ethnicity this would be one of the matches I'd be looking at very closely. Because we all have 'brick walls' in our trees there are parts of our ancestry that are a closed book - yet there will inevitably be clues amongst our matches, if only we look for them. For example, if - like me - you don't know of any Irish ancestors, but have lots of matches with cousins who do, you might begin to wonder whether one of your 'brick walls' is concealing a connection to Ireland. I can't provide you with a step-by-step guide - it's all about awareness (Louis Pasteur said that "chance favours the prepared mind"). When you look at your matches many of them will be shown as having no tree - but that doesn't necessarily mean that they don't have an Ancestry tree, simply that their tree hasn't been attached to their DNA results. This article is about confusion. I often employ homophones, words that sound similar but are spelled differently, in the titles of articles in order to catch the eye and, hopefully, encourage people to read the article that follows. They sometimes backfire - in the last issue I intentionally used the technical term 'phased' in a context where it could have been read as 'fazed', prompting a flurry of emails from readers who thought my spellchecker had misfired. I say 'readers', but in most cases they hadn't gone on to read the article that followed, which is why they didn't understand my play on words. Homonyms are words that are spelled and pronounced the same way, but have different meanings. So it's arguably appropriate that the word 'homonym' should itself be used in a somewhat different sense in this month's Significance magazine. The authors of the article use it to refer to people who have the same name - and there are few of us who have unique names if middle names are ignored. For example, you might think that I have a rare name (I certainly did when I was young), but if you Google it you'll find several other Peter Calvers, including a folk singer, a consultant, a deceased racehorse trainer, a karate expert, and even a saint (well, I was born on a Sunday - but actually it's a misspelling of 'Claver'). There are even more in the Electoral Register, including one who lives in the same village as me, though as far as I know we've never met. The researchers analysed voter lists for Paris and Marseille, enabling them to estimate that for the French population as a whole, around 80% share both their first and last name with somebody else - but because the number of forenames and surnames has increased over the past century there would have been even fewer unique names in the past. And as family historians know only too well, in earlier centuries most of the population of England seem to have been called William, John, James, Elizabeth, Ann, or Mary. This 2002 article shows (in Table 3) that in every decade between 1570-1700 almost 50% of boys were christened with one of the three most common forenames (the figure for girls was nearer 40%, but still a substantial proportion). When we're searching for the baptisms of ancestors who died before the 1851 Census we usually start in the parishes where they married, where their children were born, and where they were buried - but when the only baptism we find is in another parish, we need to look for confirmation that we've found the right parents. After all, it might be the only baptism we can find, but that doesn't mean there aren't others that we can't find - or which weren't recorded, or where the register hasn't survived. Some of the clues to look for can be found in marriage registers, which might indicate that the person being married is 'of' a certain parish (though that won’t always be the parish where they were born); the names of witnesses can also be significant. Check the burial register in case your supposed ancestor died as an infant, as so many did. Look for indications that a baptism entry might be missing - a gap of 3 or more years between successive baptisms could be a clue. Wills, where they exist, can be invaluable - and not just your ancestors' wills (I found a vital clue in the will of one of my ancestor's brothers-in-law). Tip: a forename or surname that is rare across Britain as a whole can be common in a particular locality. For example, the boys' names Roger and Nicholas are quite common in Devon, but they're rarely found in most other parts of the country; similarly the girls' names Georgiana and Christiana seem to turn up quite regularly in Cornwall. Family history is so much more than records and certificates - it's about people - so even when I read the first book in the Anna Ames trilogy from Geraldine Wall I was immediately won over! A probate genealogist with a heart and a complicated home life, Anna came over as a real person, so real that it was if the author was writing from her own experience. And nobody can have been sadder than me to read the last book in the trilogy, knowing that I might never encounter Anna Ames again. So I was absolutely delighted when Geraldine Wall emailed me last month to let me know that there was a fourth book out! File Under Fathers has at its heart a murder, but it’s not a violent book, and our sympathies are very much with the murderer. What starts out as a simple person-tracing assignment becomes much, much more complex and our heroine gets finds herself getting more closely involved than perhaps she should. But that's Anna Ames all over - always thinking about others, but not always getting it quite right. Like the rest of us! Although you could read this book on its own, it would be a great shame not to start with the first book of the trilogy and work your way through, as there are bits of the storyline that carry across from one book to the next. And I suspect that like me you'll start to think of the characters as real - so you won’t to miss out. File Under Fathers is highly recommended. Please note that although the books in this series are only available in Kindle format you don't need a Kindle to read them - I read them on my smartphone, and you can also get a free Kindle reader for your computer or tablet. In 1986, Margaret Humphreys, a social worker in Nottingham, received a letter from a woman who claimed that at the age of 4 she had been shipped to a Children's Home in Australia, and now wanted help to find her parents or relatives in Britain. The scandal of Britain's Home Children, more than 100,000 of whom were sent to Australia, Canada, New Zealand, Rhodesia, and South Africa in the 19th and 20th centuries (some as recently as 1970) really only came to light during the investigation which followed that letter, and led to the setting up of the Child Migrants Trust. LostCousins member Patricia Skidmore is the daughter of one of those children - her mother, Marjorie, was one of 329 children to be sent to the Prince of Wales Fairbridge Farm School on Vancouver Island between 1935-48. In February 2010 they travelled to England, where they and other representatives of the migrants were personally greeted by Gordon Brown, the British Prime Minister, and offered a heartfelt apology for the wrongs that were done to them, and to their families. Marjorie - Too Afraid to Cry is based on Marjorie's recollections, as told to her daughter. It includes contemporary documents to support the story, many of them from the files of the charity that treated the children so uncharitably. The conversations in the book clearly can't be verbatim, but this is only to be expected - this is a story that needed to be told. The latest book in the Jayne Sinclair series from MJ Lee covers much of the same ground as Patricia Skidmore's book, but whilst grounded in fact, the story itself is fiction. And whereas Marjorie ended up in Canada, Harry gets sent to Australia, though the treatment is equally harsh. This time Jayne isn't working for a paying client - she's helping her father's new wife to discover whether the story her mother told her before she died is true. Does she really have a half-brother who was adopted and, if so, can Jayne track him down 65 years latter - even assuming he's still alive? En route Jayne stops by the LostCousins site - a smart move, even if I do say it myself. But on this occasion it's the assistance she gets from a genealogist in Australia that helps to break the back of the case, together with our heroine's usual doggedness and inspiration! At just 99p until 26th February this Kindle book is a real bargain - after that the price goes up to a more normal £2.99, so don’t delay!!! Note: I could really relate to this story - before my grandmother died she told my aunt about a child that my grandfather had supposedly fathered before he married my grandmother. I'm hoping that one day DNA testing will lead me to his or her descendants….. In the last newsletter I pointed out how I was nearly 2 months ahead of Lloyds Bank in recognising where the fall-out from a Bitcoin crash might land, but 2 months is nothing compared to the delay in this bank story…..
On 12th February 2003 I wrote to Abbey National Mortgage Service pointing out that as our house was registered at the Land Registry they no longer needed to hold our deeds, and requesting that they made arrangements to return them. I provided a telephone number in case of any queries but I got no reply whatsoever - not a peep. Nor did they respond to the reminder I sent the following month. It took them 15 years to figure out that what I had told them in 2003 was correct - that they no longer needed to hold onto our deeds. No doubt some of you have also received unexpected packages from Santander recently - we can't be the only ones. Note: I wrote asking for our title deeds because concerns had been raised in the press about some lenders destroying these historic documents because, following the change in the law, they were no longer of any value to them; I must have thought it was pretty important at the time because I wrote the letter two days before my wedding! I've just bought a new microSD card for my phone - for just £27.99 including shipping I got 128GB, which is over 15 million times as much memory as in my first desktop computer, all in a card that's smaller than the nail on my little finger! Even more shocking was the sudden realisation that it's 40 years, bar a few months, since I bought my 8k Commodore PET with its cassette tape storage. Doesn't time fly? Philomena is being shown again on BBC2 on Saturday 24th - an excellent film about a mother looking for her adopted son (and it's true). Please do NOT copy or republish any part of this newsletter without permission - which is only granted in the most exceptional circumstances. However, you MAY link to this newsletter or any article in it without asking for permission - though why not invite other family historians to join LostCousins instead, since standard membership (which includes the newsletter), is FREE?